RNs, NPs and nursing students are once again taking their message to political leaders. 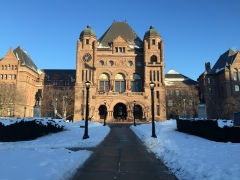 Celebrating the 19th Queen’s Park Day, RNAO members and MPPs will meet to discuss important nursing, health and health-care issues while learning about the political process on Feb. 21. Members will also have the opportunity to attend Question Period and hear directly from party leaders and health critics regarding their views on nursing, health care and the social and environmental determinants of health. If you are an interested member wanting to participate, please contact Peta-gay (PG) Batten at pgbatten@RNAO.ca or 416-408-5613. To see photos from last year’s Queen’s Park Day, please visit our Facebook page.